Cytochrome P450 Enzymes: biological catalysts of unprecedented versatility. Cytochrome P450 enzymes (CYPs, P450s) especially those responsible for drug metabolism in humans, are the unifying theme of the research in our lab. These fascinating enzymes are catalysts of exceptional versatility, and functional diversity. In humans they are principally responsible for the clearance of a practically unlimited variety of chemicals from the body, but are also critical in many important physiological processes. In other organisms (plants, animals, bacteria, fungi, almost everything!) they carry out an unprecedented range of functions, such as defense, chemical communication, neural development and even pigmentation. Recently we have discovered that P450s are present within cells in the Fe(II) form, a finding that has led to a radical revision of the dogma concerning the P450 catalytic cycle, and has implications for the control of uncoupling of P450 activity in cells. The capabilities of P450s are only just coming to be fully recognized and structural studies on P450s should yield critical insights into how enzyme structure determines function. Moreover, the biotechnological potential of P450s remains yet to be exploited. All of the specific research themes detailed below take advantage of our recognized expertise in the expression of recombinant human cytochrome P450 enzymes in bacteria. Our group is interested in finding out how P450s work and how they can be made to work better. Artificial evolution of P450s for drug development and bioremediation: a way of exploring the sequence space and catalytic potential of P450s. The demonstrated catalytic diversity of P450 enzymes makes them the ideal starting material for engineering sophisticated chemical reagents to catalyse difficult chemical transformations. We are using artificial (or directed) evolution to engineer enzymes that are more efficient, robust and specialized than naturally occurring enzymes with the aim of selecting for properties that are commercially useful in the areas of drug discovery and development and bioremediation of pollutants in the environment. The approach we are using also allows us to explore the essential sequence and structural features that underpin all ~12000 known P450s so as to determine how they work. P450s in brain: relevance to mental illness and neurodegenerative diseases. While P450s are responsible for the metabolic clearance of drugs from the human body, this is not always a benevolent process: sometimes metabolites are generated that are chemically reactive and may cause mutagenic or other toxic effects. Moreover P450s are involved in the synthesis and degradation of important endogenous chemicals, physiological roles which can be affected by drugs and dietary chemicals. We are particularly interested in the role of P450s in brain chemistry. P450s localised in mitochondria have recently been shown to contribute to the neurotoxicity of some drugs and can lead to oxidative damage to mitochondria, possibly contributing to the development of neurodegenerative diseases. After graduating from UQ with first class Honours in Biochemistry, Elizabeth took up a Royal Commission for the Exhibition of 1851 Overseas Scholarship to pursue doctoral work at Oxford University then undertook postdoctoral work at the Center in Molecular Toxicology and Department of Biochemistry at Vanderbilt University School of Medicine with Prof. F.P. Guengerich. 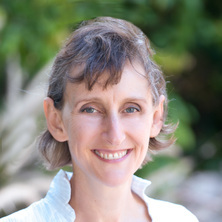 She returned to UQ in 1993 to take up a position in Pharmacology and joined the School of Chemistry and Molecular Biosciences in 2009 as a Professor of Biochemistry. Our research is leading to the development of more sustainable, environmentally friendly, chemical processes to accelerate drug development and improve the safety of medicines. Our studies into the evolution of catalytic promiscuity in P450s reveal how organisms have evolved to deal with chemicals in the environment and provide insights as to how enzymes develop novel functions. The work we and our colleagues have done to characterise the expression of P450s in the brain has suggested novel therapeutic strategies for the treatment of certain mental disorders and better prediction of susceptibility to neurodegenerative diseases. Artificial evolution of P450s for drug development and bioremediation. We are using artificial (or directed) evolution to engineer enzymes that are more efficient, robust and specialized than naturally occurring enzymes for application in drug discovery and development and cleaning up the environment. The approach we are using also allows us to explore the essential sequence and structural features that underpin all ~12000 known P450s so as to determine how they work. Jackson, Colin J., Gillam, Elizabeth M. J. and Ollis, David L. (2010). Directed evolution of enzymes. In Lewis Mander and Hung-Wen Liu (Ed. ), Comprehensive natural products II chemistry and biology (pp. 723-749) Oxford, England, Unied Kingdom: Elsevier. Gillam, E. M. J. and Hunter, D. J. B. (2007). Chemical Defence and Exploitation: Biotransformation of Xenobiotics by Cytochrome P450 Enzymes. In Astrid Sigel, Helmut Sigel and Roland K. O. Sigel (Ed. ), Metal Ions in Life Sciences (pp. 477-560) West Sussex: John Wiley and sons. The concept lens diagram: A new mechanism for presenting biochemistry content in terms of "big ideas"
Gillam, Elizabeth M. J. and Hunter, Dominic J. B. (2007) Chemical defense and exploitation, biotransformation of xenobiotics by cytochrome P450 enzymes. Metal Ions in Life Sciences, 3 477-560. Gillam, EMJ and Lennard, MS (2003) Evaluation of recombinant cytochromes P450 activity in metabolic pathways - Response. Drug Metabolism and Disposition, 31 1: 146-146. Coordinating clearance - the many phases of PXR! Gillam, E. M. J. (2002) Coordinating clearance - the many phases of PXR!. Trends in Pharmacological Sciences, 23 548-549. Gillam, E. M. J. (2002) Opposites attract, or do they? Rethinking the P450 2D6 pharmacophore model. Trends in Pharmacological Sciences, 23 501-501. S-SXR-RMs? Selective SXR response modulators - the future of designer drug interactions? Gillam, E. M. J. (2002) S-SXR-RMs? Selective SXR response modulators - the future of designer drug interactions?. Trends in Pharmacological Sciences, 23 355-355. Hang onto your haem....what's happened to CYP4A? Gillam, E. M. J. (2001) Hang onto your haem....what's happened to CYP4A?. TRENDS in Pharmacological Sciences, 22 5: 220-220. Shimada, T, Oda, Y, Gillam, EMJ, Guengerich, FP and Inoue, K (2001) Metabolic activation of polycyclic aromatic hydrocarbons and other procarcinogens by cytochromes P450 1A1 and P4501B1 allelic variants and other human cytochromes P450 in Salmonella typhimurium NM2009. Drug Metabolism And Disposition, 29 9: 1176-1182. Gillam, E. M. J. (2001) The dark side of a 'detoxification' mechanism. TRENDS in Pharmacological Sciences, 22 1: 11-11. Komatsu, T., Yamazaki, H., Asahi, S., Gillam, E. M. J., Guengerich, F. P., Nakajima, M. and Yokoi, T. (2000) Formation of a dihydroxy metabolite of phenytoin in human liver microsomes/cytosol: Roles of cytochromes P450 2C9, 2C19, and 3A4. Drug Metabolism and Disposition, 28 11: 1361-1368. Cuttle, L., Munns, A., Hogg, N., Scott, J. R., Hooper, W. D., Dickinson, R. G. and Gillam, E. M. J. (2000) Phenytoin metabolism by human cytochrome P450: Involvement of P450 3A and 2C Fprms in secondary metabolism and drug-protein adduct formation. Drug Metabolism and Disposition, 28 8: 945-950. Yamazaki, H, Nakajima, M, Nakamura, M, Asahi, S, Shimada, N, Gillam, EMJ, Guengerich, FP, Shimada, T and Yokoi, T (1999) Enhancement of cytochrome P-450 3A4 catalytic activities by cytochrome b(5) in bacterial membranes. Drug Metabolism and Disposition, 27 9: 999-1004. Hanna, I. H. and Gillam, E. M J (1998) Analysis of cytochrome P450 2D6: Substrate interactions by site-directed mutagenesis. FASEB Journal, 12 8: . Guengerich, FP, Hosea, NA, Parikh, A, Bell-Parikh, LC, Johnson, WW, Gillam, EMJ and Shimada, T (1998) Twenty years of biochemistry of human P450s - Purification, expression, mechanism, and relevance to drugs. Drug Metabolism and Disposition, 26 12: 1175-1178. Shimada, T., Gillam, E. M. J., Sutter, T. R., Strickland, P. T., Guengerich, F. P. and Yamazaki, H. (1997) Oxidation of xenobiotics by recombinant human cytochrome P450 1B1. Drug Metabolism and Disposition, 25 5: 617-622. Reilly, Peb, Mason, SR and Gillam, Emj (1988) Differential Inhibition of Human-Liver Phenacetin O-Deethylation by Histamine and 4 Histamine H-2-Receptor Antagonists. Xenobiotica, 18 4: 381-387. Gillam, Emj and Reilly, Peb (1988) Phenacetin O-Deethylation by Human-Liver Microsomes - Kinetics and Propranolol Inhibition. Xenobiotica, 18 1: 95-104. Toselli, Francesca, Worrall, Simon, Wilce, Peter A., Dodd, Peter R. and Gillam, Elizabeth M. J. (2014). Cyp2E1 and Cyp2U1 Protein Expression in Human Amygdala and Prefrontal Cortex: Influence of Alcoholism and Smoking. In: Abstracts from the 10th International ISSX Meeting. 10th International Meeting of the International Society for the Study of Xenobiotics (ISSX), Toronto, Canada, (85-86). 29 September - 03 October 2013. Rowland, S., Gillam, E. M. J., Hamilton, S. E., Ramakrishna, M., Reid, A., Smith, C., Ward, L. C., Wood, I. and Wright, A. (2010). Rebuilding a generalist biochemistry course around core concepts rather than heavy content: Painting the big picture for a large mixed-learner cohort. In: 21st Biennial Conference on Chemistry Education, Denton, TX, U.S.A., (). 1-5 August 2010. Henly, D. C., Gillam, E. M. J., Huxham, G. J. and Forrest, A. (2003). Web-based problem-solving exercises in assessment. In: 3rd International Symposium on PBL in Dental Education. 3rd International Symposium on PBL in Dental Education, Victor Harbour, SA, (). January, 2003. Kinobe, RT, Dickinson, RG and Gillam, EMJ (2001). Deletion of glutathione S-transferase theta-1 (GSTT1) and anticonvulsant (ACD)-induced hypersensitivity syndrome. In: , , (115-115). .
Notley, L., Avent, K., Noble, C. J., Hanson, G. R. and Gillam, E. M. J. (2001). Characterization of CYP3A4/3A5 chimeric enzymes: catalytic and electron paramagnetic resonance (EPR) studies. In: J.A. Hanson, Proceedings of the 6th International ISSX Meeting. 6th International ISSX Meeting, Munich, (90-90). 7-11 October 2001. Notley, L., Avent, K., Noble, C. J., Hanson, G. R. and Gillam, E. M. J. (2001). Characterization of chimeric mutant enzymes derived from P450S 3A4 and 3A5: catalytic and electron paramagnetic resonance (EPR) studies. In: R. Lange, 12th International Conference on Cytochrome P450. 12th International Conference on Cytochrome P450, La Grande Motte, France, (73-73). 11-15 September 2001. Kinobe, R. T., Dickinson, R. G. and Gillam, E. M. J. (2001). Deletion of glutathione S-transferase theta-1 (GSTT1) and anti-convulsant (ACD)-induced hypersensitivity syndrome. In: P.F.A. Wright, Proceedings of the IXth International Congress of Toxicology. IXth International Congress of Toxicology, Brisbane, (22-22). 8-12 July 2001. Gillam, E. M. J., Notley, L., Guengerich, F. P., Shimada, T. and Lennard, M. S. (2000). Examining tissue-specific bioactivation in vitro: Cytochrome P450 1B1 and other extrahepatic forms in the metabolism of carcinogens. In: Pacifichem 2000 Proceedings. Pacifichem 2000 Proceedings, Honolulu, USA, (). 13 - 20 December, 2000. Kinobe, R., Dickinson, R. G. and Gillam, E. M. J. (2000). Genetic deletion of glutathione S-Transferases Theta-1 (GSTT1) and MU-1 (GSTM1) and the aromatic anticonvulsant drug-induced hypersensitivity syndrome. In: W.C. Hodgson and R.E. Loiacono, Proceedings of ASCEPT. ASCEPT Annual Scientific Meeting 2000, Newcastle, Australia, (107). 3 - 6 December, 2000. Oda, Y., Aryal, P., Gillam, E. M. J., Guengerich, F. P. and Shimada, T. (2000). Involvement of human P450s in the metabolic activation of heterocyclic amines using UMU tester strains. In: Proceedings of the Environmental Mutagens Society. Meeting of the Environmental Mutagens Society, New Orleans, USA, (). April, 2000. Notley, L., Crewe, K. H., Lennard, M. S. and Gillam, E. M. J. (2000). The biotransformation of tamoxifen by human vytochrome P450 enzymes leads to the production of potentially genotoxic metabolites. In: W.C. Hodgson and R.E. Loiacono, Proceedings of ASCEPT. ASCEPT Annual Scientific Meeting 2000, Newcastle, Australia, (106). 3 - 6 December, 2000. Shimada, T., Aryal, P., Gillam, E. M. J., Guengerich, F. P. and Oda, Y. (2000). Use of recombinant human P450 enzymes in the studies of drug metabolism and chemical carcinogenesis. In: Proceedings of the Millennial World Congress of Pharmaceutical Sciences. Millennial World Congress of Pharmaceutical Sciences, San Francisco, USA, (). 16 - 20 April, 2000. Hanna, IH, Gillam, EMJ and Guengerich, FP (1998). Analysis of cytochrome P450 2D6 : substrate interactions by site-directed mutagenesis. In: Faseb Journal. , , (A1427-A1427). .
Guengerich, FP, Shimada, T, Gillam, EMJ, Sutter, TR and Wunsch, RM (1998). Expression of human cytochrome P4501B1 in bacteria. In: Faseb Journal. , , (A1425-A1425). .
Yamazaki, H, Gillam, EMJ, Dong, MS, Johnson, WW, Guengerich, FP and Shimada, T (1997). Comparison of reconstitution conditions for recombinant human P450 2C9 with systems containing P450S 1A1, 1A2, 2D6, 2E1, and 3A4. Effects of P450-P450 and P450-b(5) interactions. In: Faseb Journal. , , (A790-A790). .
Gillam, EMJ, Wunsch, RM, Ueng, YF, Shimada, T, Parikh, A, Kamataki, T and Guengerich, FP (1997). Expression of P450 3A7 in Escherichia coli: Effects of 5' modification and catalytic characterization of the recombinant enzyme. In: Faseb Journal. , , (A796-A796). .
Dong, MS, Guo, Z, Philips, DR, Bell, LC, Howard, E, Blair, IA, Gillam, Emj, Baba, T, Waterman, MR and Guengerich, FP (1995). Retention of N-Formylmethionine in Recombinant Bacterial Cytochrome-P450 Enzymes Containing the N-Terminal Sequence Malllavfl. In: Faseb Journal. , , (A1486-A1486). .
Guo, Z, Sandhu, P, Gillam, Emj, Martin, MV and Guengerich, FP (1994). Expression and Purification of Human Cytochrome-P450 Enzymes From Escherichia-Coli. In: Faseb Journal. , , (A1256-A1256). .
Guengerich, FP, Kim, BR, Gillam, Emj and Shimada, T (1994). Mechanisms of Enhancement and Inhibition of Cytochrome-P450 Catalytic Activities. In: Lechner, MC, Cytochrome P450. 8th International Conference on Cytochrome P450: Biochemistry, Biophysics and Molecular Biology, Lisbon Portugal, (97-101). Oct 24-28, 1993. Kim, BR, Baba, T, Gillam, Emj and Guengerich, FP (1993). 3-Alpha-Hydroxylation and 8,9-Epoxidation of Aflatoxin-B(1) by Cytochrome-P450-3A4 - Evidence for Allosteric Behavior in Microsomal-Membranes and a Recombinant Enzyme. In: Faseb Journal. , , (A1168-A1168). .
Sandhu, P, Gillam, Emj, Baba, T, Kim, BR and Guengerich, FP (1993). Expression of Human Cytochrome-P450 Enzymes in Escherichia-Coli, Purification, and Reconstitution of Catalytic Activity. In: Faseb Journal. , , (A1168-A1168). .
Gillam, Emj, Omori, S, Sandhu, P and Guengerich, FP (1992). Expression of Human Cytochrome-P-450-3A4 and Cytochrome-P450-2E1 in the Bacterium Escherichia-Coli. In: Faseb Journal. , , (A323-A323). .
Gillam, Emj and Harvey, DJ (1991). Spectral Studies Investigating the Binding of Cyclosporine-A to Hepatic Cytochromes-P450. In: HLAVICA, P and DAMANI, LA, Biological Oxidation of Nitrogen in Organic Molecules. 4Th International Symp On the Biological Oxidation of Nitrogen in Organic Molecules, Munich Fed Rep Ger, (147-155). Sep 17-21, 1989. Does the active site of cytochrome P450 3A4 accommodate activators and substrates simultaneously? Investigations of cytochromes P450 using the DNA family shuffling method.